Rear active cooling duct with 40mm fan and LED lighting (Duplicator 4 dual) by CyberMosfet is licensed under the Creative Commons - Attribution - Share Alike license. This is another fan duct for the duplicator 4 dual to provide active cooling and LED light to the nozzle working areas. The 40mm x 40mm x 10mm fan is positioned vertically behind the stepper motors. The big advantage of this is that the fan does not obstruct the view of the nozzles. I printed it out with clear PETG filament so that the whole thing lights up with the 2 installed LEDs. Most of these type of cooling ducts require active cooling to be build, which is a problem, since you don't have an active cooling duct yet... This model includes fine bridge support structures already included in the design. This can be removed once the print is complete. 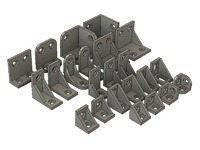 These structures offer more effective overhang support then the support offered by most slicing algorithms. This makes it possible to print this item without active cooling. • Clear view of the nozzles - the fan duct is at the back. • The LEDs illuminate the nozzle working areas. • Less obstructions within the fan ducts = more air flow. • Air is concentrated on the nozzle tip, not the heating element. • Attaches to the rear carriage with two 3mm bolts and nuts. Back wall thickness increased from 1.1mm to 1.2mm. Extended centre wall to support the middle protrusion of the duct when it prints - it curled upward while printing. Fan set 1mm inward - the 10mm fan stuck out by 1mm. Changes to the temporary support of the blower outlet ridge - it curled upward while printing. There are 4 files that can be downloaded. One set is with LED holes and one set is without LED holes. 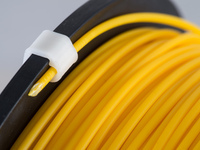 Then there is the option of downloading it with or without included overhang support structures. You need to print out 2 fastening clips. 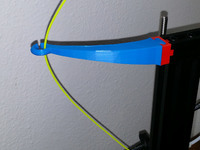 You can get the fastening clips from http://www.thingiverse.com/thing:537918 called ActiveDuctV2.0_Clip.stl. Use two 3mm bolts and nuts to fasten the fan to the carriage. The 40mm fan is fastened with two 3mm self tapper screws. The tollerance of some of these fans are extreme - some fans will be a tight fit. Be carefull that you don't break the back wall of the duct when installing the fan. The fan power can be controlled directly with the MightyBoard of your duplicator - from where you can control it via the GCODE. Please visit http://www.thingiverse.com/thing:537918 to find out how to connect the fan to your duplicator. I also included the Design Spark Mechanical .rsdoc file if you want to take it from here. Say thanks by giving CyberMosfet a tip and help them continue to share amazing Things with the Thingiverse community. We're sure CyberMosfet would love a Tip, but unfortunately they have not setup their accounts to receive them yet.